Indonesia's decentralization has shifted to the devolution process to cities and districts resulting in a large creation of new autonomous regions. Decentralization is claimed to improve public service provision. However, the transfer of public service delivery to local government together with the process of government units’ proliferation is argued to lead some challenges in the fiscal balance and administrative capacity of the local government. Meanwhile, there are also arguments on the political motivation behind decentralization and district proliferation. 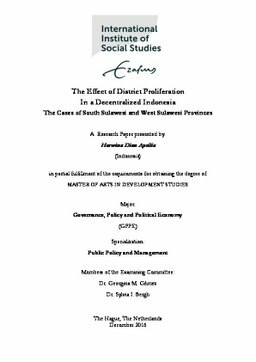 This study tries to examine the effect of government's unit proliferation to the allocation of fiscal resource and the outcome of education service in South Sulawesi and West Sulawesi provinces, by comparing the conditions of the proliferated region compare to the non-proliferated region and the child region compare to the parent region. Although stronger conclusions are not possible due to the limitation of descriptive statistic method to handle causality issue, the findings of this study demonstrate that apart from any political motives behind government units’ proliferation process in Indonesia, there is the potential that new district creation may enhance service delivery by increasing the sensitivity to local need, with additional remarks that such benefit comes together with additional cost for both local government and central government.